Posted on January 30, 2019 at 7:59 am. UNION, Ore. — Stephanie Rovey traces her goat dairy business back 28 years to her first 4-H project at age 12. She can also trace her current stock back to her base breeding herd — 12 white Nubians. She has been with goats longer than with her five children; longer than with her husband Byron; longer than almost anything. They have accompanied her on moves to college, to Arizona, and to Oregon. While her parents thought goats were a passing phase, her interest and experience propelled her to study agriculture and to build goat dairy business that is now her livelihood. Today Stephanie, Byron and their five boys — ages 14, 11, 9, 7 and 5 — raise seed crops, forage, and goats outside Union, Ore. 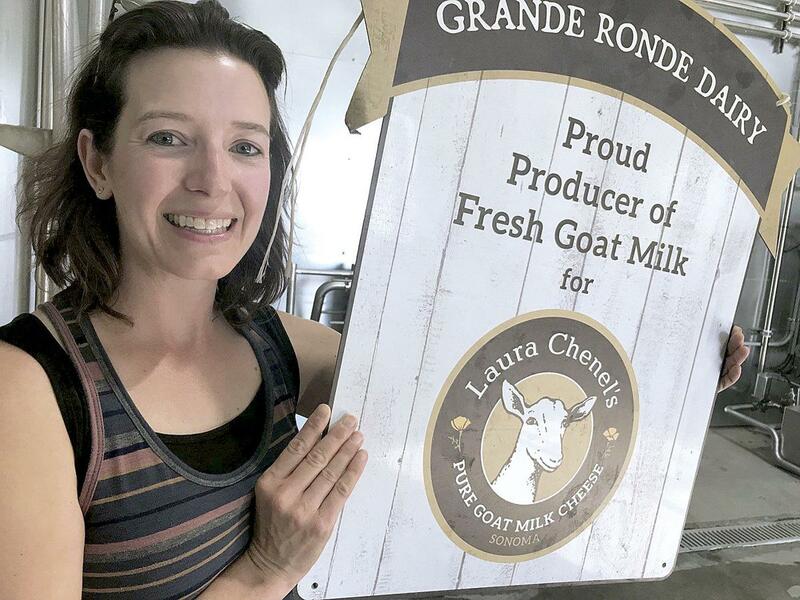 They established Grande Ronde Dairy in 2015 with 20 backyard goats, converting an old barn into a milking parlor. Their goat dairy business grew steadily until 2017 when they made a leap to significantly grow their herd and business. They were buoyed by increasing interest in goat milk and by their milk buyer, Laura Chenel Chevre, a cheese company in Sonoma, Calif. The magnitude of Grande Ronde Dairy’s growth from a homemade setup to a state-of-the-art facility is quickly understood by the numbers. The Roveys started with a 10-stall milking parlor and a 1,000-gallon bulk tank in a freezing, converted barn. Today their 60-stall GEA rotary parlor can milk 300 goats per hour and fill their 5,000-gallon bulk tank every three days. The dairy has grown to 350 lactating goats with 200 more coming on by May. At capacity, their loafing barn will house about 1,000 lactating goats plus replacements waiting to come online. The new rotary parlor has also increased the sophistication and efficiency of the dairy. Goats walk up a ramp and past a sensor that dispenses grain in the stall feeder. Once in the head catch, the goats’ ear tags are scanned automatically so milk production, content and safety testing can be tracked goat-by-goat. The Roveys’ GEA brand rotary milk parlor is the first of its kind installed at a goat dairy in the U.S. Stephanie and Byron flew to New Zealand in 2016 to see the equipment in action and tour dairies. They came back inspired to duplicate the New Zealand model. “In New Zealand dairies have maximized both animal comfort and efficiency,” Rovey said. As she spoke, the wind picked up and the automatic curtains in the loafing barn began to rise. “The curtains open and close based on temperature to keep the goats happy,” she said. The temperature control, deep bedding straw, automatic waterers, and ample room for movement are all by design. While goats are much maligned as “can-eaters” and “poor man’s cows,” Rovey eagerly lists the advantages dairy goats over cows. Goats have a higher feed-to-milk ratio, making them more efficient milk producers. They can be bred at seven months and milked by 12 months whereas cows take about two years to become productive. “Goats also have a 100 percent replacement ratio,” she said, since they generally have multiple kids. She also sees a lot of room for market growth for goat milk given consumer trends toward more healthful, less processed foods. The USDA also attributes the popularity of goat milk for cheese making to its higher fat content than cow’s milk. More fat per gallon means more cheese per gallon. “Goat milk is the most easily digested of all the milks,” Rovey said. A University of California-Davis analysis of goat milk found that it has less lactose than cow’s milk and is similar in protein content. Due to its differing protein structure, goat milk doesn’t elicit an allergic response and is palatable for many people with cow’s milk allergies. Rovey’s dream is to see goat milk offered as an alternative in school cafeterias and used in infant formula. She also sees goat milk as a high-in-protein alternative to nut-based beverages. As for the taste, she encourages people to give goat milk a chance. “Don’t give up on goat milk or cheese because you tried it once and didn’t like it.” She notes that dairy goat management and goat milk processing have come a long way in recent years. Backyard goat milk from the neighbor is not the highly palatable product her dairy produces. “Any milk will taste bad if the animal is eating weeds,” she said. By contrast, the Roveys feed 100 percent Triticale, grass, alfalfa, and pea forage from their farm and supplement with grain during milking. Rovey hopes that major brands establish processing plants in Idaho, Washington and Oregon.